Original Source: Found it by google. It was originally a pretty dodgy image, saved as a low quality .GIF and the colours were too bright and bland. I generally avoid pixelated/dithered quality images if I can help it. So, I started by blurring out bits I could and then highlighting/burning in the right areas. Did the usual enhancements and effects to bump up the colour and just make it a well blended image with a bit more quality. Cropped and saved. I'm currently very addicted to Nabari no Ou! Love the colors in the wallpaper. Very relaxing and nice to look at. And I'm now using it as meh desktop. But for the future: please remember to write an actual description about the wallpaper (i.e. how you made it, how long it took, etc etc) or else I'll have no choice but to delete it. Quote by Chloe-chanLove the colors! ^_^' Sorry about that! I fixed it now. :nya: I love Yoite x Miharu, even during the OP, you could feel the UST coming through. 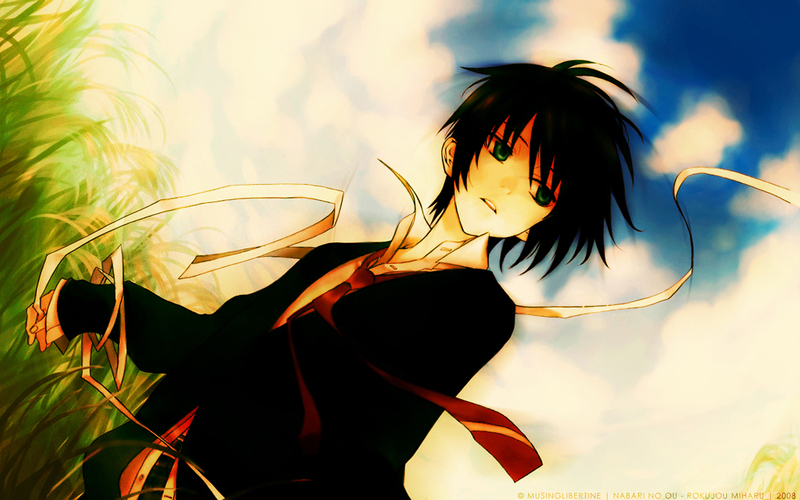 Aaah Nabari no ou,i like this anime,this boy is so cute.Very much nice wallpaper,i like it. Thanks for wallpaper, it's nice!